It was a sight that would even make the Fonz shed a tear or two. In early July, a stray female pit bull mix was spotted on the streets of Savannah, Ga., carrying a long-haired male chihuahua in her mouth. The smaller dog had a nasty eye infection. Occasionally the pit bull would set him down and gently lick his gooey eye, much to the appreciation of the chihuahua. The BFFs were picked up by animal control officer Christina Sutherin on July 10, and named Joanie and Chachi after the two lovebirds on the ’70s TV sitcom, “Happy Days.” Chachi immediately underwent surgery, but his ruptured eye could not be saved. 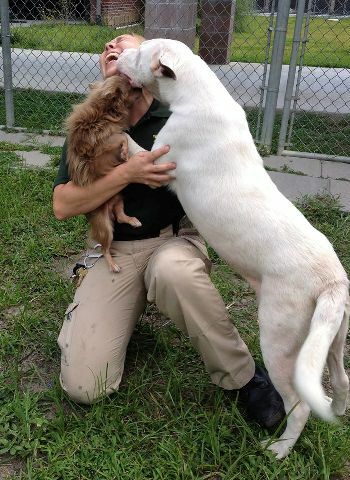 A few days later, he was reunited with his lady love, “and shelter staff were treated to an emotional reunion of the two canine friends, complete with licking, whining, caressing and finally cuddling,” according to a July 16 update on the Savannah-Chatham Metropolitan Police Department’s Facebook page. If this were a “Happy Days” episode, the show’s theme song – performed very, very slowly by violins – would start up right about now. …But hold those violins! Sutherin, who in February received a Civilian of the Year award for her work with shelter animals, was able to find a new forever home for Joanie and Chachi in Florida. They will relocate there this month, after the waiting period required by state law to transport animals across state lines after inoculations has passed. Here’s hoping Joanie and Chachi last a lot longer than 1982’s short-lived “Happy Days” spinoff. I’d like to dedicate its theme song, “You Look at Me,” to a very special pit bull and chihuahua.